Notice that this product is more than just an effective insecticide. While it will kill many pest insects including mites, it will also repel those same insects for over two weeks and last but not least it will prevent fungal diseases. It is located here because it will be effective in killing many pest insects. 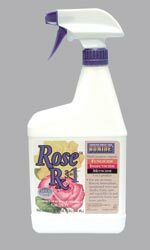 For use on roses, flowers, houseplants, ornamental trees and shrubs, fruits, nuts and vegetables in and around the home and home garden. Control: blackspot, powdery mildew, rust, spider mites, aphids, whiteflies, and other insect pests. For more details using Neem as a fungicide go to Using Neem As A Fungicide.